The key element of Zijlstra’s analysis concerns the problem of unsettled international balance of payment deficits. Allow me to first give you the elementary basics of a balance of payment and do so as much in layman’s terms. A balance of payment represents a nation’s financial affairs with the outside world. When for example a nation imports more than it exports, it runs a trade deficit. This deficit has to be financed in some way. The manner in which such a deficit is financed is registered on the balance of payments. Basically, it is either financed through selling off reserves of central banks, is financed with the proceeds of foreign investments, or is financed through drawing on credit from abroad. During the heyday of the classical gold standard, deficits were settled in terms of gold, as gold is the traditional denominator of currencies. To finance deficits, gold was exported as a means of settlement, thereby decreasing the monetary base, setting limits to credit extensions and which all together enforced tighter financial conditions. This forces a nation to reduce its balance of payment deficit and export more to cover for imports. This way, gold functioned as a check that ensured a balance with the outside world. Under Bretton Woods a couple of tweaks were made to the classical gold standard. 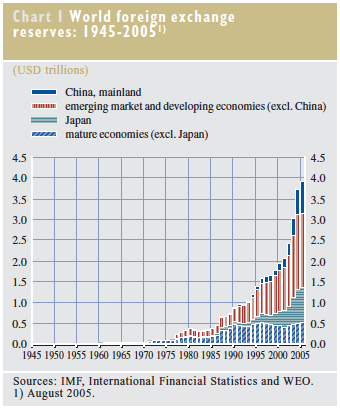 The financial arrangements of Bretton Woods defined the framework as a gold exchange standard. Basically, the currency of the United States was fixed in a weight of gold with all other currencies fixed in terms of the dollar. At any time, official holders of the reserve currency were able to convert dollars into gold. This latter feature is important because instead of immediate settlement, non-reserve nations had the option of holding on to excess dollars (or pound sterling) and invest them in government bonds instead so as to have an additional source of income on their reserves; hence gold exchange standard. Now, the reserve status basically entails two things. First, a reserve currency is used outside the nation where it is issued. It functions as a means of exchange for international transactions. A company from Europe that sells products to a business somewhere in Asia for example made use of the reserve currency to settle their trade. Secondly, a reserve currency denominates financial assets of parties outside the reserve nation, meaning that the reserve currency is held for future business, and consequently is deposited with a banking institution. The importance of this aspect is that reserve currency countries are able to denominate international credit they draw on in their own currency; a currency that they issue and — depending on its central bank mandate and other domestic stipulations — are able to create at will. The appeal of a reserve currency is that there is an implicit advantage because the international use of a reserve currency lowers transaction costs for internationally operating businesses. Since the reserve currency is widely used, it can be virtually used anywhere, and as a consequence, this creates the scope and depth for a market for dollar denominated financial assets. This defines the reserve currency as very “liquid”. As Zijlstra explained, at the time Bretton Woods was institutionalized, the US economy made up for half of the world’s income and beside, America’s gold reserve was truly immense so that the external use of dollars was firmly supported by America’s economic strength. However, under the Bretton Woods arrangements, asymmetric flows of trade between nations were managed differently than before. As briefly noted, once a nation runs a trade surplus and another a deficit, the question becomes how these nations settle the differences. Under Bretton Woods, central banks’ currency reserves were supplemented with reserve assets other than gold, namely dollar and, until the 1970s, pound sterling denominated financial assets . It was this possibility that in and by itself put forward a fundamental problem because it raised the question of how to deal with the credit nature of these additional currency reserves . As the Bretton Woods arrangements allowed for the inclusion of financial assets that are issued in the reserve nations, the US were able to postpone settlement of their deficits. So while Europe recovered from the devastation of World War II during the 1950s and the economic tide gradually turned, the US gradually transformed into a trade deficit nation. During the 1960s this gave emergence to the accumulation of US (and British) government bonds in the monetary reserves of central banks. This asymmetry has two sides since at one hand, the US stimulated foreign exporting industries by drawing on international credit while on the other hand, limits to the extent to which international credit could be relied on became ever more evident. Once these unsettled bills became extraordinary large, a problem emerged: at the official price of gold, there were too many dollars held outside of the US to redeem them into gold. The returning feature in Zijlstra’s analyses was very much about international rules and their application in the pursued domestic policies by cooperating nations, or as Zijlstra put it himself, “non-cooperating” nations. Zijlstra’s emphasis of this point is crucial because he pointed to the fact that once a government administration is able to pursue policies to the detriment of other nations, and is able do so beyond the reach of independent and regulatory oversight as instituted with the IMF as agreed to, then any international monetary framework with the objective of international monetary and financial stability is doomed to fail; especially when it concerns the reserve issuing nation. Despite all early warnings from abroad, especially from various European nations from the 1960s onwards, US President Richard Nixon decided in August 1971 to postpone dollar convertibility where he could simply have raised the price of gold and devalued the dollar. Instead of dealing with past accumulated and persistent balance of payment deficits through a revaluation of gold — which according to the articles of the IMF was very well possible — President Nixon choose to close the “gold-window” all together. With this decision, President Nixon not only removed the only check that to a large, yet intrinsically insufficient degree had enforced an international balance , he also postponed the whole of the Bretton Woods agreement and with this as Zijlstra disclosed in his 1992 autobiography, he eliminated the reason d’être of the IMF. After this decision, settlement could be deferred indefinitely and along with “floating”, or in fact continuously depreciating currencies, the official role of the IMF was rendered meaningless. Devaluations and revaluations became ad hoc measures, or put differently: central bank policies were relegated to advanced forms of monetary escapism. The logical question that followed the events that led to the collapse of Bretton Woods was that if international credit was indeed not retired and could only be extended over and over again, then how would all this end? Since 1971 a lot has changed, yet materially, the dollar remained central to international monetary arrangements and accordingly, international flows of goods and services were, and still are consumed by the United States on a net basis. In fact, since 1976, the United States has run a deficit on its current account every single consecutive month. The implications of these ever growing “international imbalances” or what basically is the accumulation of unsettled bills cannot be underestimated. Zijlstra referred to these post Bretton Woods arrangements as “non-agreements”. To make this issue a bit more explicit, as mentioned before, dollars are not only used as the medium to finance cross-border trade, most notably oil, more importantly, through the inclusion of excess dollars as the denominator of currency reserve assets, central banks other than the Federal Reserve have in a way “collateralized” their currencies with financial obligations originating from the United States. It is with this feature of the current international financial arrangements, most problems of the current crisis can be understood and can be explained. Simply put, if one does not foot the bill for what is consumed, someone else pays. In this same parlance, what applies to ordinary people applies to nations as well. No matter how you look at this crisis, dollars that were once earned outside the United States are a form of credit extended to the United States and instead of continuous settlements through gold — whether this is done on a monthly, quarterly or annual basis — payments are deferred indefinitely and consequently, this leads to an accumulation of international credit in the form of dollar denominated assets in the currency reserves of central banks. To give you an idea of the size of this ever-growing “imbalance”, the graph on the right depicts this exuberant international “reserve” accumulation . This mountain of (predominantly) dollar denominated assets is the result of decades long non-settlement. In a way inflation already happened, it is just that Mr. Market has not priced it in fully because it will take a shift in paradigm to reveal the inflation has already happened. 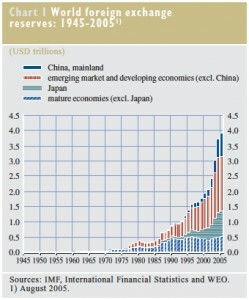 This constant outflow of dollars had to be absorbed by the rest of the world one way or another. Central banks have thus been confronted with this constant struggle or dilemma, because under all circumstances, non-US businesses that received dollars in return for exported products have a variable need to exchange dollars with their respective banking institutions for local currencies as to be able to pay for their input costs. So either a central bank converts inflowing dollars into freshly “minted” domestic currency — and “go on a dollar standard” as Zijlstra referred to it — or in the alternative, starts negotiating with the IMF (until the 1970s) or follows a (relative) appreciating trajectory of its currency in order to avoid a too rapid expansion of its monetary aggregates instead. With this latter option however (which after 1973 was done on an ad hoc basis), a nation attempts to prevent a too high level of domestic inflation and negative consequences that one must associate with credit induced “waves of malinvestments”. It thereby takes recessionary tendencies for the nation’s exporting industries for granted. As a result, labour intensive industries may have chosen to leave the country all together because businesses foresaw they would become unable to overcome the rise of input costs due to the appreciation of the currency in which they incur costs. Moreover, this latter approach also means that a nation voluntarily chooses to discount the relative value of their accumulated foreign exchange reserves as well. This recurrent dilemma that central bankers have been confronted with, can hardly be called easy because either a central bank accepts to pay the price by “dosing” inflation into the economy and debasing its currency (think of the “financialization of real estate” for example, or piling up government debt), or accepts to pay the price by writing off the value of their accumulated “reserve assets” beside inducing negative conditions on exporting industries through a higher exchange rate. As central banks other than the Federal Reserve have had to accommodate this constant inflow of dollars, they therefore have pursued different strategies to manage their economy’s absorptive capacity to allow for these inflows to occur. It lies beyond the scope of this elementary summary to go into too great detail, but suffice it to say that Japan and China have taken a very different approach than Europe. Whereas Europe has maintained a structural (external) balance of payments equilibrium (Europe’s problems are found with intra-European balance of payment imbalances), Japan and China opted for absorbing dollars through converting them into local currencies. This way, they stimulated exporting industries and have thus opted for the accumulation of dollar denominated reserve assets, while increasing the monetary base through financial asset creation. Considering this dilemma, one must recognize dollar outflows from the United States as the driving force that leads to cycles of overinvestment on asset markets elsewhere, or put differently, it leads to the creation of financial bubbles. 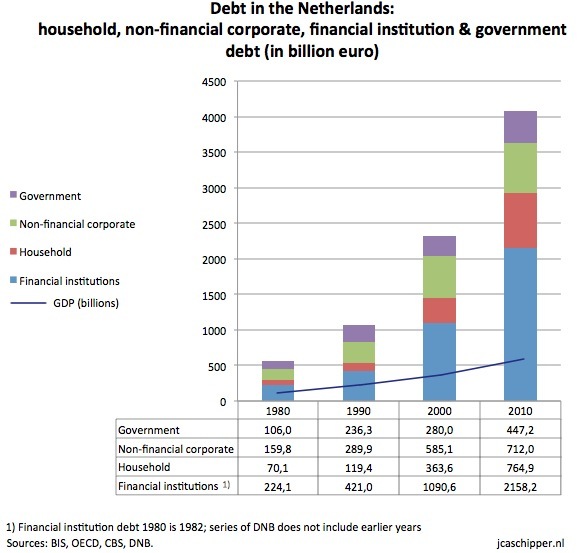 To illustrate this point, the graph on the right depicts what has happened in the “financially conservative” Netherlands from the 1980s onwards: exponential growth in total debt with a somewhat linear growth of GDP. Obviously, the structural challenges underlying these figures are plenty. Nevertheless, we have to solve these problems of our own making. This illustration brings me back to what I mentioned as the key problem that Zijlstra kept pointing at, the credit nature of “supplementing parts” of currency reserves due to balance of payment deficits. This constant inflow of dollars does not only lead to over-indebtedness within domestic economies due to the conversion, or basically, the non-settlement problem, but it also gives rise to further distortions on the international stage. This latter point entails that dollars (albeit in different degrees by various nations) are recycled by central banks (or Sovereign Wealth Funds) through banks in the United States (or internationally operating banks) that invest these dollars on behalf of foreign monetary authorities in US Treasuries or other supposedly “risk-free” financial assets. Whatever the quality and safety of these financial assets (which are a matter on their own), this constant flow of recycled dollars reduces interest rates within the United States  and when borrowing becomes relatively more cheap, a credit boom is likely to follow and this in turn gives rise to a further deterioration of the US balance of payments and thus increases (or at least prolongs) the problem of (past) US balance of payment deficits. This vicious circle, or race to the bottom, could be condensed with the conventional summation that in a way the US “exports capital” this way, but one could as well recognize the euphemism for what it is and conclude the world subsidizes the cause for their recurrent dilemma to become ever more greater because productive surpluses finance what the United States cannot afford. It is almost superfluous to add but this is the very definition of an “unsustainable” global economic model. The essence of the problem that Zijlstra kept pointing at cannot be dismissed: gold disciplines the external spendthrift of nations. Remove the check that enforces a balance and a chronic imbalance follows. It is precisely this aspect that defines Zijlstra a proponent of an impartial application of rules for governments to abide by, whether one country considers itself “first among equals” or not. Gold as such, is only a check that ensures the balance. To adapt to these wretched circumstances however, there are at least two policies to consider. First, a policy mix that ensures a balance of payment equilibrium must be pursued. Second, a central bank must insulate its balance sheet and along with it, the value of the currency it issues, for “fiscal shocks” through gold. Instead of collateralizing a currency with government bonds, foreign or domestic, a more solid footing must be arranged for. Summed up: to maintain an international balance, both temptations of becoming a creditor and debtor must be resisted. Long after his active career, in 1991, Jelle Zijlstra became member of the European Advisory Board on Economic and Monetary Integration. Today, Europeans subscribe to the lasting legacy that other Europeans and he accomplished: the euro, a currency that cannot be collateralized by government bonds (or “fiat decree”), defining Europe’s common currency as a social contract between citizens and their central bank. Add to that an external balance of payment equilibrium and mark-to-market accounting of gold, and you can fathom that the ECB’s balance sheet and Europe at large are insulated for political opportunism, both foreign and domestic. Nevertheless, Europe must count its blessings and stand firm to resist the many temptations put forward by the spring tide of political opportunism. This crisis began with the inclusion of credit in the monetary reserves of central banks so any solution starts with addressing this non-foundation of the international monetary framework and in very practical terms this means that dollar denominated assets must be removed from the equation of currency reserves of central banks. Essentially, it is about removing any one country’s debt and this defines the question for the 21st century’s international monetary framework to be about, not which nation will be “hosting” a new reserve currency, but how this world can prevent having to rely on one. After all is said and done, the world will once again have to acknowledge that gold is the ultimate risk-free monetary reserve asset that — if allowed — is able to prevent international cheating. That is, “importing without ever settling”. That is the ultimate conclusion I draw from the analysis by Jelle Zijlstra, because what else can establish international cooperation on an equal basis? What else can guarantee an international balance? What else but gold? See the work of prof. Catherine Schenk of Glasgow University for how and why the United Kingdom gave up its reserve status during the 1970s. See Zijlstra’s analysis of 1967. This point was “persistently insisted” upon by the French delegation when the issuance of special drawing rights (SDRs) by the IMF was discussed and considered. Zijlstra wrote in his 1992 analysis: “The old framework did not collapse because it had intrinsic deficiencies that prevented it from functioning like it did for twenty years after the war. It was thrown over board by the United States at the moment that the discipline it demanded to participating countries was knocking on America’s door.” I disagree with Zijlstra’s assessment that the framework came without intrinsic deficiencies although I acknowledge his point that if the United States had altered its policies, the collapse of the Bretton Woods framework could have been prevented. Personally, I think it is a fundamental deficiency to base an international monetary framework on any nation’s ability to issue the currency that denominates the currency reserves of others. This allows a nation to inflate at will and do so to the detriment of other nations. This view is not new, nor original; especially the analysis put forward by Jacques Rueff during the 1960s and 1970s pointed to this flaw. It is important to note that about 70% of the reserve accumulation shown in this graph are dollar denominated financial assets. Within the paper there are several other useful graphs and tables that go into greater detail. For estimates, see the paper mentioned under footnote 4; page 23-25. This article is not in any way meant as an investment advice or a solicitation for such an advice. Like all writings on my website, they are exclusively intended for educational purposes. Readers should do their own research and make up their minds what to do with their (life) savings. I have done so as well; I am long physical gold (and a “tiny bit” of silver) exclusively. you gave to me the will to discover more in depths Dr Zijlstra . Being French Rueff has been my first choice till now but I do need to add some more other visions. How do you see this crisis unfold , gold reevaluation or else ? I found Rueff’s analysis more to the point than Zijlstra’s. I think Zijlstra’s earlier analyses had to be diplomatic because of his position as central banker. Beside, Zijlstra was a scholar at heart and was not about to part with his preference for a balanced and nuanced view. Anyhow, one of the reasons to translate his analyses from different years is to allow an insight in the way his views developed. Compared with these earlier analyses, his 1992 analysis is more direct, perhaps even confrontational. How this crisis will unfold? I think Stein’s Law applies: “If something cannot go on forever, it will stop”. One way or another, gold will be revalued eventually. Excellent summary — the clearest illustration I have seen of how the USD ‘settlement problem’ leads directly to bubbles and credit expansion in different currency blocks. How does the EZ maintain balance of payments equilibrium? I assume it’s not a happy accident, so what mechanism/policy controls this? To be honest, I do not have any insight how this is achieved exactly, so the following points are more a direction where to look than a conclusive claim that this is the actual way how it is done. Looking at the economy in structural terms along with a strategic perspective, I would consider the following points. 1. European Common Agricultural Policy: Europe is a net exporter. 2. Energy imports: paid for in terms of gold. 3. A large financial sector that actively manages foreign exchange. Put differently, eurodollars are not exclusively ending up in US Treasuries and in the currency reserves of ncb’s, they are predominantly recycled through European banks and put to work internationally. 4. Nations need to balance outgoing credit balances and incoming credit balances, meaning nations must aim for a balanced position of not being, nor becoming a creditor or debtor nation. Clearly, within Europe, this is a key problem. With the outside world, it is not so much. 5. FDI management and balancing outgoing FDI and incoming FDI. 6. Industrial policies. Just an example: Why did Europe subsidize EADS (/Airbus) into existence, helping it to become a global competitive player? Perhaps there are more ways to achieve an external balance of payments equilibrium, but I never found any articles going into this subject, or at least, not in practical terms. Mostly, this subject is covered in abstract (academic) terms (and I read too many of them ;P). Just an idea that came without thinking too much to complement your remarks above. Without the Euro , Germany would have had a Deutschmark reevaluated (or the other currencies devaluated). Therefore its export capacity would have been scaled down: EZ is maintaining the balancing thanks to german exports that are supported by a Euro to low (only for Germany) no ? That this is only relevant to German exporters, I would say it includes all exporters (there are plenty of Dutch, French and Italian exporting companies that I can name right away), so with a couple of nuances I would say yes on the general idea. Also, I agree that if the old currencies had been around, chances had been pretty solid that southern Europe had devalued with northern Europe revaluing relatively. However, the problem with an assessment like this is that it is a counter-factual one: you need a different universe (..Gödel or otherwise ;P) where these currencies still existed in order to know if this would have really occurred. Because such a universe is firmly out of reach we won’t ever know this, so you won’t hear this counter-factual reasoning coming out of European officialdom (..never rely on a counter-factual argument to make your case). Nevertheless, I think that if we would have had the old currencies around, the door to competitive devaluations (and competitive non-revaluations, i.e. capital controls) and trade sanctions (tariff wars etc.) would have been wide open. I think a simple question suffices to clear up what a likely result would have been: Would the Greek government chosen austerity and had reformed what is fundamentally wrong and deeply flawed, or would they have opted for an easy devaluation, thus ‘externalizing’ their financial problems to detriment of their friends and neighbours, thus opting for an electoral continuance of printing bonds to finance what they collectively cannot afford? I think we all know the answer and I am quite confident that all European politicians* understand it, including the Greek. With the euro, this door is firmly closed. And to use an analogy to relate the euro to other fiats, the euro floats in a vast ocean of depreciating fiats just like any piece of wood would. No matter how low the ebb or how high the tide of FX-rates is, due to ECB’s balance sheet (mark-to-market gold and all what is behind the euro**), it automatically adapts to the effects of shifting tides, and more importantly, it is constructed to outlast the long overdue fiat storm. * ..When it comes to our politicians, I always like to paraphrase Jean-Claude Trichet and say that “cynicism is warranted”. Put differently, political/electoral promises are easily defaulted upon. I have been through your work on “series of analyze”, and what a work it has been . I have not finished yet , it takes me quite a lot of time to understand so to translate I don’t even imagine how long and difficult it was. You are definitelly right Zijlstra was “from the serail” as we say in French and it is absolutely great to see the evolution of his thought process. Let me compliment you once again on the analyze above it is probably the best synthesis I have read in years totally Rueffeian style and to me it means a lot. I am searching for papers, thought of Rueff post 1971 to try to understand how he analyzed the “floating” before he passed away, and it is not easy . PS: your post on “Gold as the monetary cosmos’ sun” is brilliant too , I am going to be forced to buy the book.. Thank you very much for your kind and flattering words. As I wrote in my introduction, despite it really was time-consuming, it was well worth my time. I wish I had learned about his analysis (or that of Rueff) during my time at university. Anyhow, I hope our media for once not look abroad for answers, but look at the analysis of one of our greatest Statesman instead. We owe him that much. As for how the euro can weather any storm, just look at the ECB’s balance sheet and look at the first line on the asset side and liability side. It defines the euro; all the rest is credit (all other items are merely “denominated in”, except these). Simply put, physical gold bids on paper (any pieces of paper) and in regard to the euro, gold has been restored as the exclusive denominator of the currency. So the euro is not “backed” by gold (and obviously not by any government debt) — thereby not defining credit as a weight of gold (which in extremis would be defaulted upon eventually) — but instead, gold is pricing the euro, while the euro is used to price credit. Gold is in this respect free to evaluate the management of “the houses of credit”, albeit in a different way than under a classical gold standard. The current financial paradigms are very different as is the pricing mechanism of gold. The current gold price is not based on actual physical supply; it can best be summed up by “paper chasing paper”. As soon as this phantom supply of paper gold is gone (and from where I am sitting, this is closely tied to inevitable events in the US Treasuries market), a very different price will be revealed. The euro allows that price to be established. Why else put gold supremely on top of the balance sheet along with the amount of euro in circulation? There is a very good reason for this as well as to account for gold mark-to-market. There simply is no other way to address systemic insolvency (credit/counterparty risks) other than to revalue gold (or as Zijlstra phrased it: “all currencies must be devalued”). For a more elaborate exposition of how and why the euro will weather the storm, I think you can better start with reading FOFOA if you haven’t already. I mean, the ECB papers are fine, but I do not think you will find the answers there; FOFOA has plenty of valuable insights. In all honesty, if it hadn’t been for him, I am not sure if I had figured it out. I think I was close, but not near where I am now. I think the dozen or so blog posts by Victor (the Cleaner) gives you a very lucid view on the euro as well. Btw, I am not sure whether Rueff wrote about floating exchange rates — I had the impression he wanted to restore fixed exchange rates — but perhaps he wrote about convertibility mechanisms (fiat into gold and vice versa). If you find any articles, French or otherwise, I would appreciate it if you send them. Though my French is not sufficient to speak it fluently, je pense que je peux suivre avec un dictionnaire français-néerlandais. Hope to write a new article soon..
Can you help me visualize that European alternative… in other words I can see how dollars are physically exchanged to local currencies and spent on US Treasuries, but what exactly happens in Europe? Now, normally with a balance of payment equilibrium, if the mechanics of supply and demand work properly, the euro needs to — at least relatively — appreciate vis-a-vis the dollar (and other currencies). That is, if nothing else is done. But this is not the case. To counter too much appreciation of the foreign exchange rate, the supply of euros in terms of monetary aggregates is inflated. These are credit aggregates (not ‘real’ money supply) and this “inflation” is enclosed in euro denominated financial assets. (This is where Europe’s problems are all about. It is caused by intra EMU-BOP imbalances; countries spend (import) more than they can afford (export) and that needs to be addressed and corrected). The last number I heard Mario Draghi mention is that on aggregate there are some €55 trillion in euro denominated financial assets available. 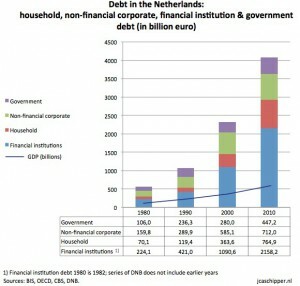 The Dutch part is what you see in the graph I compiled*. This vast supply of investable euro denominated assets surely means a thing or two for the euro’s exchange rate. Let me put this differently, so long the dollar reserve paradigm holds, the euro remains an agnostic currency (it is not printed ad infinitum to equal the dollar’s weaknesses nor can it be broken through a “=” parity with gold; hence agnostic). Once the dollar paradigm breaks, the euro will be strong in gold (the euro will not be backed by gold; instead, it allows to be priced by gold; it already is (mark-to-market accounting)). Thanks for the reply Jaco. BTW, is the equilibrium in EMU’s BOP a result of balance of trade between Europe and the World in general, but Europe and US in particular? See article 123. It prohibits the ECB to finance EMU government deficits. In other words, the euro cannot become collateralized with government bonds. To give you a summary in my own words, the ECB is chartered with one objective: price stability. This reflects the prohibition of monetary financing of EMU government deficits. Basically, the euro is thereby first and foremost a contract between the ECB and European citizens. Compare that to other fiats. The Fed for example, has a dual mandate: price stability and full employment. The latter is the basis for, and provides the legitimacy for the Fed to finance the US government. Through deficit spending (fiscal authority) and loose monetary policy, including monetary finance (monetary authority), full employment can supposedly be achieved. Never mind that this is theory exclusively, but thereby, Federal Reserve notes constitute to a contract (money) between the government and the Fed. The US government has thereby created itself the privilege to confiscate through inflation.